Jerry L. Hayhurst, 78, of Bowling Green, Ohio passed away November 4, 2018. She was born November 22, 1939 in Dayton, Kentucky to Kendall and Elizabeth (Valentine) Ray. On May 16, 1958 she married the love of her life David Hayhurst and he survives in Bowling Green. Jerry was an avid sewer, making numerous memory bears out of loved ones clothing for family and friends. She was a homemaker and loved to cook large meals from scratch for her family. She was extremely charitable making and donating numerous items to a variety of different organizations. Jerry was very loving and what she cherished most in life was spending time with her family and pets, including her beloved late dog Max, birds, cats and various other wild life. Along with her husband of 60 years, David, Jerry is survived by her sons James Hayhurst of Toledo, Ohio and John Hayhurst of Bowling Green, Ohio, daughter-in-law Kathy Pultz of Bowling Green, Ohio, sisters Anna (Robert Youtsey of Alexandria, Kentucky, Peggy (Matz) Racke of Florence, Kentucky and Juanita (Richard) Smith of Butler, Kentucky, brother John (Mary) Ray of Elizabthtown, Kentucky, grandchildren Misty (Kristopher) Kaczmarek, Noah Tipton, Crystal (David) Ball and Josh Keatley and great-granddaughter Lily. She was preceded in death by her daughter Constance Hayhurst, and brothers Seldon Ray, Kendall Ray Jr. and Bill Ray. A Celebration of Life Service will be held on Friday November 9, 2018 at 11:00 a.m. at Dunn Funeral Home, located in the Historical District of Bowling Green at 408 W. Wooster St. Rev. Kathy Archer will officiate. 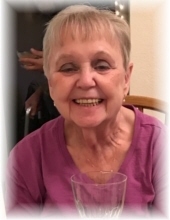 Visitation will be held Friday morning at the funeral home from 10:00 a.m. until the time of the service at 11:00 a.m.
Memorial contributions may be given in her memory to Bridge Hospice, 1069 Klotz Road Bowling Green, Ohio 43402. The family asks that any flowers sent be pink and purple as those were Jerry's favorite colors. To send flowers or a remembrance gift to the family of Jerry L. Hayhurst, please visit our Tribute Store. "Email Address" would like to share the life celebration of Jerry L. Hayhurst. Click on the "link" to go to share a favorite memory or leave a condolence message for the family.